Mytheresa is an industry leader in the world of online luxury fashion and retail. For over 30 years the highly successful Mytheresa store cemented its status in Munich as a pillar of style and taste, and in 2006 it widened its customer base globally by launching a small e-commerce extension. Today, over 500 employees work together to create an unforgettable online shopping experience. What makes Mytheresa so unique? An exceptional curation of products from over 200 of the world’s most covetable fashion brands, exclusive designer collaborations and fast and reliable delivery to more than 130 countries across the globe. 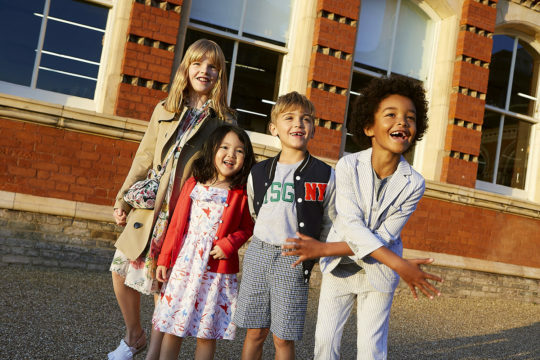 In January 2019, Mytheresa launched finally its kidswear section. It carries clothing, shoes and accessories for girls and boys aged 2 to 12 and babies aged zero to 36 months. The range debuted with 35 brands, spanning well-known designer names including Fendi Kids, Dolce & Gabbana, Gucci, Chloé, Stella McCartney and Acne Studios, as well as specialist childrenswear brands like Bonpoint and Tartine et Chocolat and streetwear label Palm Angels. The new offering is targeted at existing Mytheresa customers, 40 percent of whom have children. We had a chat with Fashion Buying Director, Tiffany Hsu, appointed in 2017. Born in Taiwan and graduated at Central Saint Martin’s College, she is now overseeing different buying departments and driving fashion direction by developing capsule collections, exclusive products and special fashion collaborations. 1. How would you describe the concept of Mytheresa Kids? We are taking a very mini-me approach mirroring our current womenswear designer portfolio. We are really focusing on our current customer base who is very aware of what’s hot in fashion. However we also have iconic kidswear only-brands such as Bonpoint, Monnalisa and Tartine et Chocolat to really complete our offering. 2. Are you realizing mood images for your website? Do you think these images could influence the shopping experience of the customer? We are doing seasonal dedicated shoots for Mytheresa Kids and we have very accurate and detailed images of our products with styling ideas. This definitely helps our customers in choosing what is right for their kids. 3. How do you think online shops will evolve in the next future? As technology evolves online shopping will be more seamless and a lot more personal, virtual reality will hopefully be the next generation of e-commerce. 4. Kids and Internet… what do you think about it? Our kidswear category mainly caters to parents who shops for the kids, so we are taking a very mini-me approach. However kids are very tech-savvy these days and they know what they want, so I wouldn’t be surprised if kids themselves are browsing the site and picking what they like. There are a lot of mini influencers out there who are inspirations to our mini customers. 5. Do you have a hint for parents when they shop for their kids? I think comfort and quality are very important! Obviously you also need to keep it fun as kids really know what they want these days! 6. You are based in London. What’s the best place for kids there? One of the best places there for kids is definitely the London Zoo! LEGO! And I loved playing outside in the nature – just mud and water!! 8. Which museum even kids would spend hours in? The Natural History Museum in London – the dinosaur skeletons there are amazing! I also love the Childhood Museum which is part of the V&A and it has a great selection of vintage toys. I think the Egyptian rooms in the British Museum is also great for kids, I was really obsessed with Ancient Egypt and Greek mythology as a child – it’s quit special to see the artifacts in real life. I grew up with my younger siblings so I am pretty good at hanging out with kids! I will make sure they do not get a lot of sugary treats from me as they get a little crazy on too much sugar! And we will probably start of the day paying in the park so they get really tired from running around and then we can go home to do something crafty – I am pretty good at making things from play dough and kids like to get their hands dirty! After that we will probably have a little nap and watch cartoons together! I follow Coco Pink Princess and all my influencer friends who have kids such as Susie Bubble, Charlotte Groenveld of Fashionguitar and Yoyo Cao. These are all kids I actually get to spend time with! … Be kind and be imaginative, nothing is impossible!